This site has been established to allow our various related families to communicate, collaborate, share information and memories on all aspects of family news and history, past, present and future. The general area of this site is open for viewing by any one, anywhere, but privacy controls restrict certain database information to registered family members only. If you believe you are connected to someone on this site I strongly recommend that you contact me so that we can determine your family connections as any data relating to living individuals on this site is restricted to family tree members only to protect their privacy. If you are certain you have a connection to a member you can apply for access and once your registration is approved, you will be given permission to view additional information on living persons as well as see various photographs and documents. I also encourage you to help me add information about your family to the family tree. Barrett (sometimes spelled Barret or Barratt) is a surname that has been associated with several different people, places and organisations. It is a popular Anglo-Irish surname, both in Southeast England, and Southwest Ireland. It is most common in the Irish counties of Mayo and Galway but particularly County Cork, and within England, East Anglia, especially Norfolk. The Gaelic version of the name is Barόid in the south and Bairid in the west. The Barretts of Ireland first appeared following the Norman invasion, hired as mercenaries from Wales. As with many other Anglo-Norman families, they were quickly assimilated into Irish culture. As an English surname, it is thought to derive from an Old English word meaning "quarrelsome" or "deceitful", or from a corruption of the Norman personal name Barnard or Berold. Another translation for Barrett is "warlike people." The nationality of Barrett clans can be very difficult to determine in cases which country boundaries change over time, making the original nationality a mystery. The original ethnicity of Barrett may be difficult to determine depending on whether the name came about naturally and independently in various locales. Also check out our "Most Wanted" page to see if you can help me with information on difficult to research individuals. 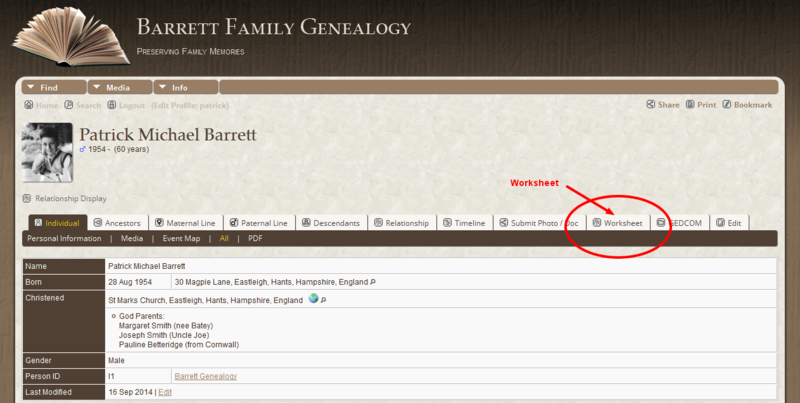 The software used by Barrett Family Genealogy is very comprehensive and meets the needs of almost every genealogist. With that being said there is a certain amount of learning required to make the most of your visits to the website. The project is continually growing with new information gathered regularly from my own research and information provided by other family members. When you log into the site do a search for your own name and go to your own individual page where I have entered the known information I have about you. As indicated in the image above there is a link to a Worksheet. Open the Worksheet and complete as much information as possible and submit the form. This will allow me to update the database and ensure that your information is correct and up to date. It also allows me to add other members of your family to the tree if they are not presently included. When you visit the pages of other individuals there will be similar forms available from the same location on the page where you can also add information about their families. It’s important to complete these Worksheets as it is the easiest way to add individuals and their information to the tree. There are other ways you can add information and media to the tree but this is the easiest way to get started. I will deal with other methods in another post. You can return to these Worksheets at any time and add more information or update any changes. Free app to scan, manage and store your photos and documents. Photos and documents are an important means of preserving our memories and family history and most of us probably have boxes of old photos and documents stored away somewhere. 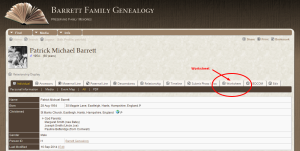 Part of the process at Barrett Family Genealogy is to create a digital collection of photos and documents of all family members in every branch of our family tree. If you would like to contribute to the collection, the first part of the process is to convert the original media into a digital version. If you have a smart phone (iPhone, android or windows) or iPad or tablet it has now become very easy to scan photos and documents using the camera on your device and a free app called CamScanner. I have been using it for some time and its amazing. The basic account is free which provides all the best features but if you use the link below you can receive 1 month of free premium service. After the first month you will still retain the free account. I highly recommend it. Click here to get the FREE CamScanner App. We all know a picture is worth a thousand words and when it comes to family history there is no substitute for a photograph of one of our ancestors. It’s great to be able to look back through the generations and see the family resemblances being passed down through the ages. Photos are a great addition to any story and quite often photos are the only historical record of an event, person or item. 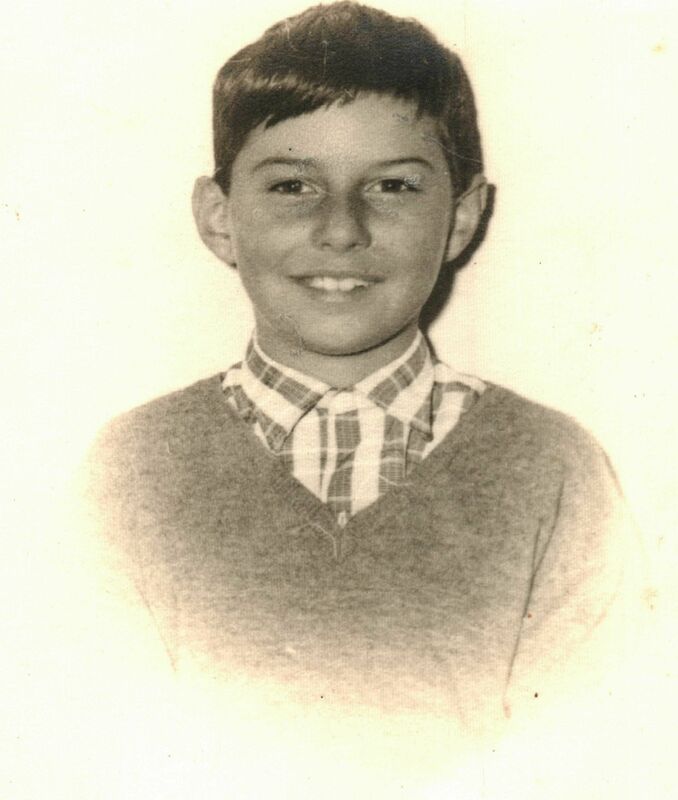 Unfortunately photos are often lost, damaged or destroyed so, as part of the process of preserving our family memories, I am putting together a digital collection of as many family connected photos as possible. Genealogy is much more than putting a name in a tree along with a photo and a few dates. Its a reconstruction of a persons life where we preserve as much detail as possible. What did that person like or dislike? What type of lifestyle did they live? Did they have hobbies or play sport? Were they in the military? There are so many questions that a single photo can answer. I would like to request that you consider contributing photos you may have to this collection so that others can share the wonderful stories these photos have to offer. 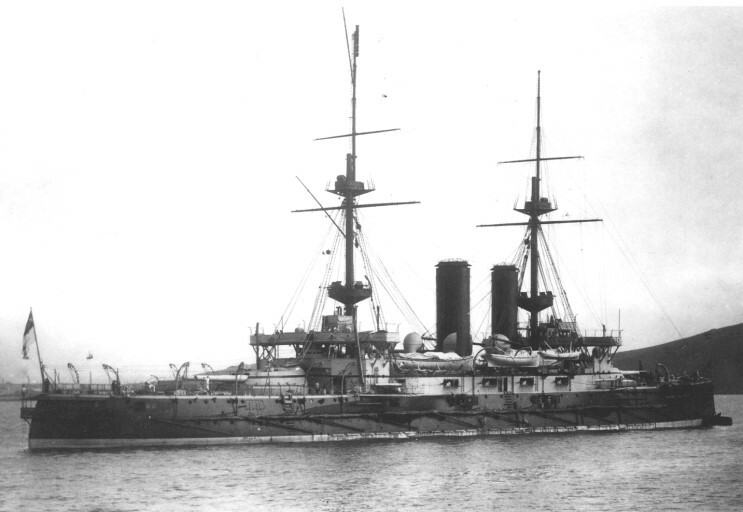 The photo to the left is the HMS Bulwark on which William Walter Scott was killed when the ship exploded off Sheerness in 1914. I am the 2 x great nephew of the wife of William Walter Scott and this photo adds a great visual reference to his personal story. Please consider sharing you photos with me so that I can add them to this digital collection. Photos of people, places and things all add a visual dimension to an otherwise statistical background. Start looking for photos both old and new and I’ll follow this post soon with information on how you can easily add your photos to this collection. Genealogy research is most successful as a shared, group effort. If you have questions, corrections, any information to contribute, or interested in unwatermarked copies of photos or documents, please contact me or use the 'Suggest' tab on the individual pages. All messages will receive a response. Looking forward to hearing from you. Patrick. Join us in our conversation on Facebook. Random photos of ancestors past. Birthdays in the next 30 days. Anniversaries in the next 30 days. Deaths in the next 30 days. No Deaths for the next 30 days.